Life can be a series of highs and lows. My life has certainly been a testament to that. Met and married my wonderful husband Eric – High. Tried to conceive for a couple of years, failed fertility treatments, surgery – Low. Successfully got pregnant through IVF – HUGE High! High risk pregnancy that left me on bed rest for what felt like most of my pregnancy – Low. Delivering premature but healthy twins – High/Low. Five weeks and one day of being separated from them in the NICU – Low. I could go on and on. I want to share with you one of my favorite Highs. He is my little Miracle High. Eric and I were told that there was absolutely no way that we could conceive naturally. For that reason we went through IVF to conceive Ethan and Ella. I have no doubt that it was, indeed, a fact. As I said this is a Miracle High. I woke up just like the day before. I had no idea that this morning would change all of our lives so much! Eric was getting ready for work and I was lying in bed watching Sports Center (his choice, not mine). I remembered that I needed to call in a prescription that day. Before I could get it, I had to take a pregnancy test. My cycle was running way too long and I needed to get on progesterone to get me back on track. I always thought this was a funny thing for me, of all people, to have to do. I mean, we know I can’t get pregnant. On top of that, I went back on birth control after I had Ethan and Ella. I was simply taking it for convenience sake. Eric and I often laughed about what money we wasted on all those birth control pills early in our marriage. So off I went to pee on my little stick. I unloaded the dishwasher, sat down, and watched TV for a minute. Should I get the kids up? Oh no wait…better go check the test and get that out of the way. I walked into the guest bath and looked at the test on the sink. Double take…were those TWO lines? Huh? I must be seeing things. I heard Eric say something so I threw the hand towel over the test and jumped back in bed. Eric said, “Why do you look so weird?” I was still in shock so I said, “Just tired.” He went back to the closet to finish getting dressed and I ran back to the bathroom for a second look. Yes. Definitely two lines. How did this happen??? I mean I know how it happens for most, but not us! We were told that we couldn’t get pregnant on our own. Holy cow. Eric’s birthday was the next day. Boy, could I have fun with this!!! I ran upstairs to get the babies up and whispered my secret in their tiny ears. I was pretty sure they smiled. Thankfully Eric left shortly after that. I am told later that I am in MAJOR trouble for letting him go to work because he would have called in sick. Whoops. I quickly called my mom, my sister, and Kristen. Kristen, my personal OB nurse, reassured me that the home tests are pretty accurate. Even so, I had my mom come over so I could get an official blood test at the doctor’s office. I still didn’t believe it. I went and looked at the home test again. Still two lines! When I called Dr. Blake’s office to get the test they acted like I was crazy. “Mrs. Greer, we usually don’t do blood tests if you have a positive home test.” I replied, “I know, but I don’t believe it. When can I come in?” I went in immediately, got my blood drawn, and paid to have the results to me stat. I cried and prayed on the whole way home from the doctor’s office. I was smiling ear to ear and laughing as I praised God. I am sure anyone who passed by me on the road thought I was crazy. And I was. Crazy happy. I couldn’t believe God’s blessing on us. How could this be? It took so much for us to get pregnant with Ethan and Ella. Nothing had changed with us. We were still infertile. I mean, I was on BIRTH CONTROL too! This was really a miracle straight from above. All day I avoided calls from Eric and his sister, Amy. How in the world could I play this one off? I couldn’t even sit down I was so excited! I finally got the “official positive” test results from the doctor. Hallelujah! Praise God!! I checked the home test one more time and finally threw it in the trash. 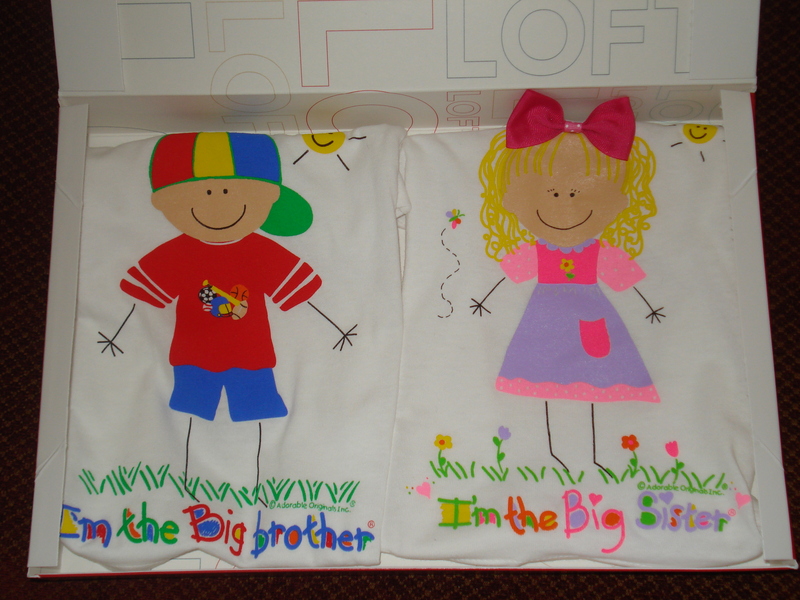 I decided I would get the kids Big Brother and Big Sister t-shirts, take their pictures in it, frame it, and give it to Eric for his birthday. Well I am not sure how many of you have tried to get a 16-month old kid to stand still so you can get a good picture of him. Now throw in a second child. It isn’t possible. Just take it from me. So I decided the next best thing was to just wrap up the shirts and let Eric open those. We waited on pins and needles until Eric got home. Of course since we were anxiously awaiting him, he didn’t get home until after 7. After the kids’ bath, Eric read them a story, and then they just had to give their Daddy an early birthday present. I turned the camera off right after I told him so we could all snuggles. There were lots of happy tears all around. I was told later that Eric was thinking “Why in the world did she give me some shirts for the kids for my birthday?” Apparently what I thought was pretty plain isn’t plain to a man. « Am I Worthy of Redeeming Love? The sweetest story ever! Thanks for sharing it. Wow, that brought tears to my eyes! !